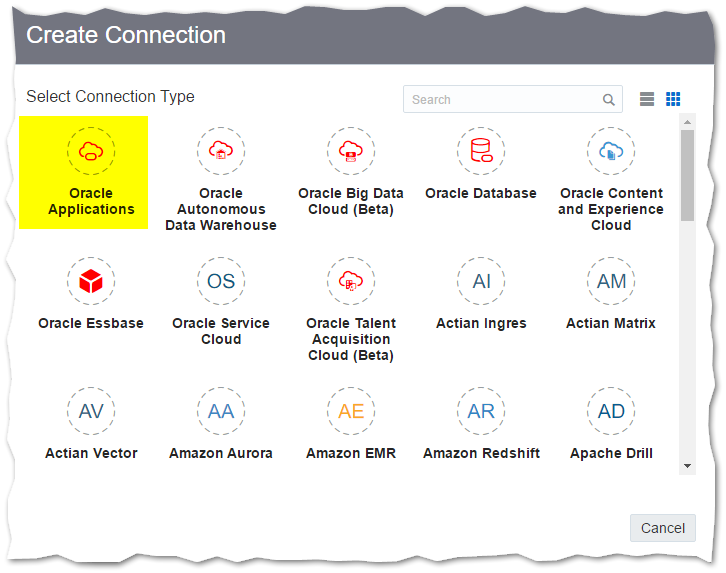 the full set of readiness content can also be accessed from the Oracle Fusion Cloud Applications homepage. 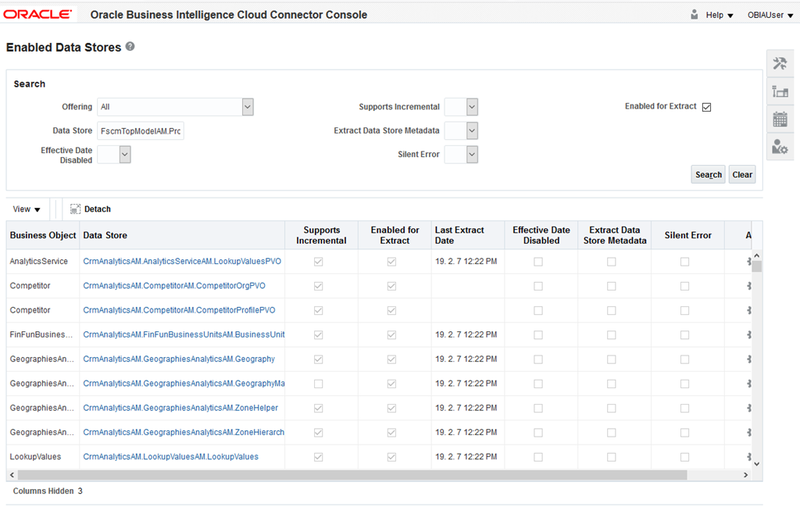 in order to extract data from Oracle Fusion Applications Cloud, BICC needs to be used. 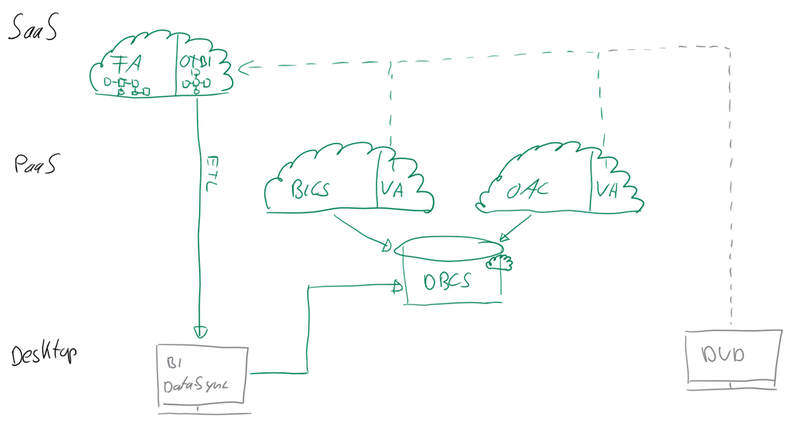 This is part of every Fusion Applications Cloud and is typically reachable by extending the URL with /biacm e.g. 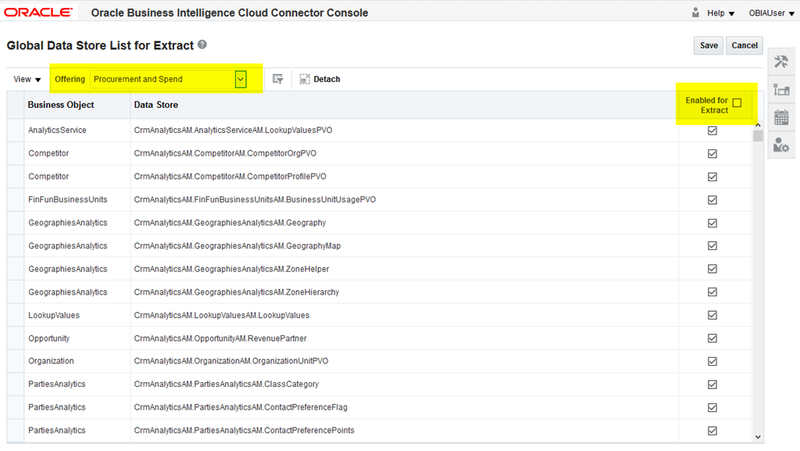 This is indeed the Review Cloud Extract Configuration page of the top right navigation menu and allows to click on a PVO (Data Store) to further check the configuration of the PVO in terms of associated offerings (OBIA modules) and to be selected attributes (columns) of the PVO (Public View Object). This will enable the PVO for use within BICC and the extraction process. In the background these PVOs are created, additionally they will also be associated with the respective OBIA Modules, hence for an OBIA implementation of Human resources, only the required PVOs for HR are extracted from Fusion Cloud. After removing the associated offering from the PVO, the customization can be saved and on the following screen of PVO summary, the PVO can be closed by clicking “Done” to get back to the Review PVO page. This Data Store List screen can also be used for temporary test of deselecting a PVO from a offering (OBIA module) extract. 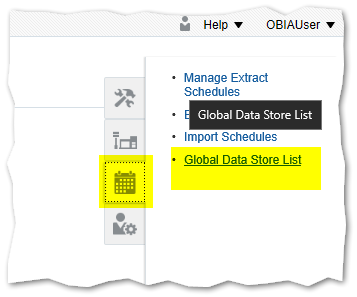 Typically, the OBIA module is selected from the offering drop-down menu and the enabled for Extract checkbox in the header of the table is clicked to enable all associated PVOs for extract, but an individual PVO can also be deselected for the list, to only affect this specific run (e.g. for temporary testing purposes). 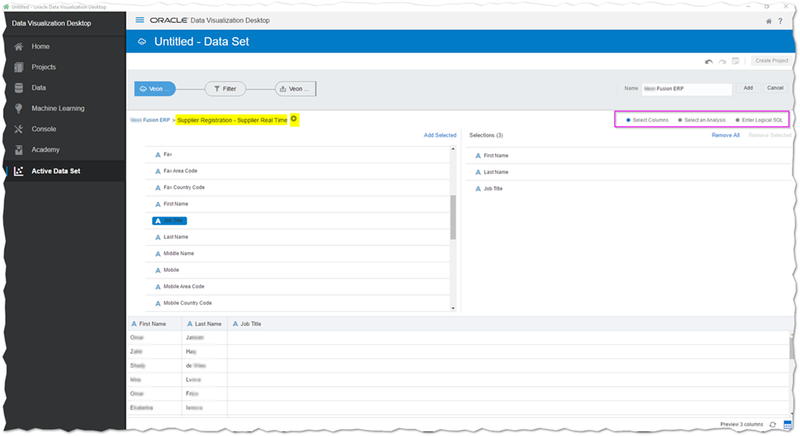 Thus, a PVO can be removed from a offering for all subsequent runs or just an specific run (using the Data Store List of the Manage schedule screen). After deselecting the checkbox e.g. of Select List, the PVO needs to be saved. These changes will then be saved for the next extract run with BICC where the deselected attribute will not be part of the select statement and thus not be retrieved. 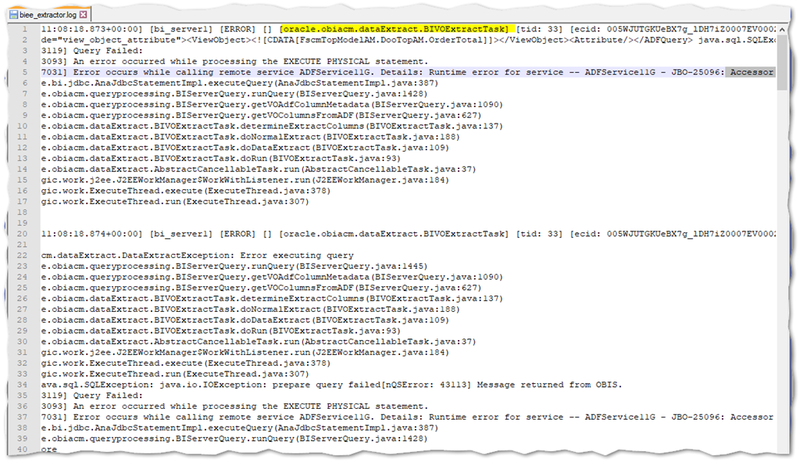 Since, this column hasn’t been available and caused the extract issue, the issue has been fixed by also deselecting the attribute from the PVO definition. 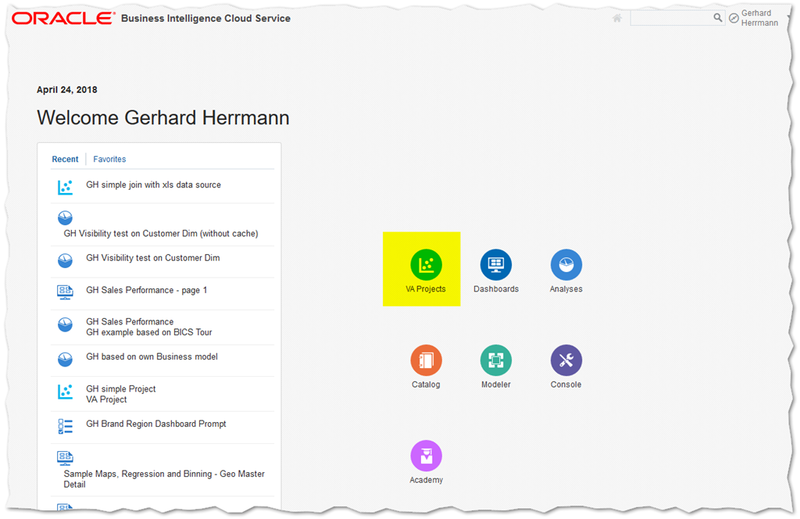 After validating the user, the Oracle BI Application modules need to be selected within BICC for extraction. 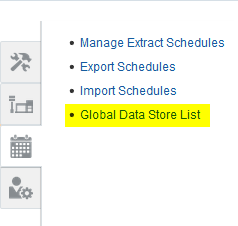 This can be done by clicking on the calender icon of the top right menu and clicking on Global Data Store List. 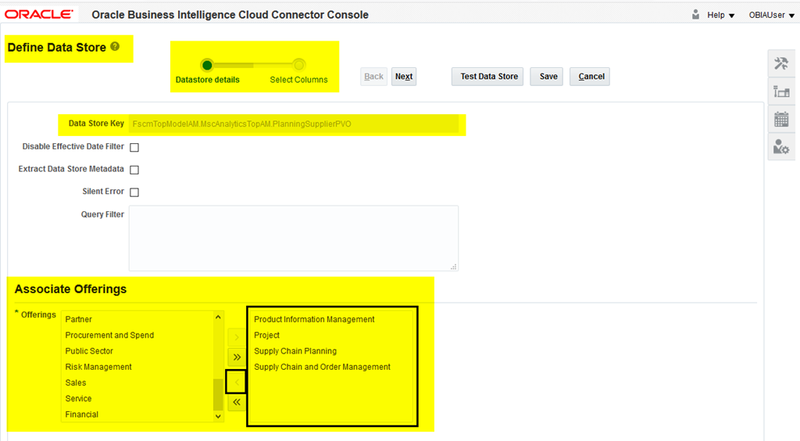 This opens the page to enable the Oracle BI Application product offerings / modules within BICC for Fusion cloud extract. 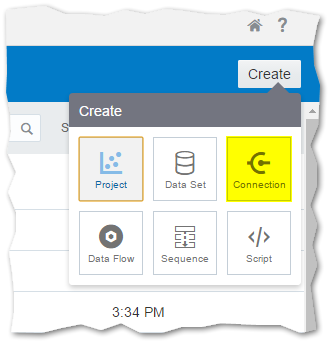 The offering must be selected from the drop down list and then be enabled for extract. 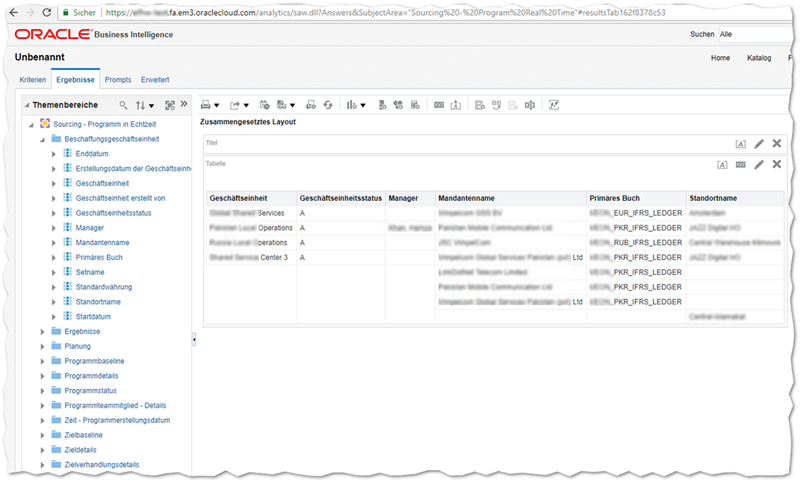 After all required modules have been selected, the modules can be extracted to UCM (this is the bundled file storage of any Fusion Cloud instance and may be used by multiple Fusion modules e.g. 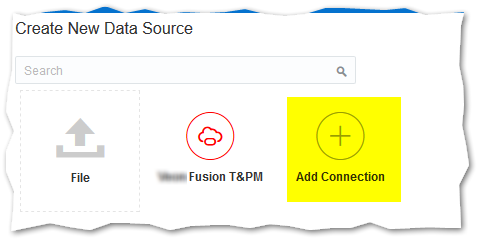 the data import to Fusion Cloud itself). 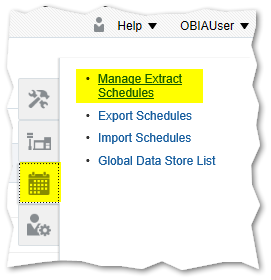 The extract can be configured by clicking on Manage Extract Schedules on the top right menu. Then selecting immediate as recurrence setting the job will be run after saving it. The following Article is written as of April 2018. Since, the Cloud is evolving rapidly, it may not apply in full, in future. 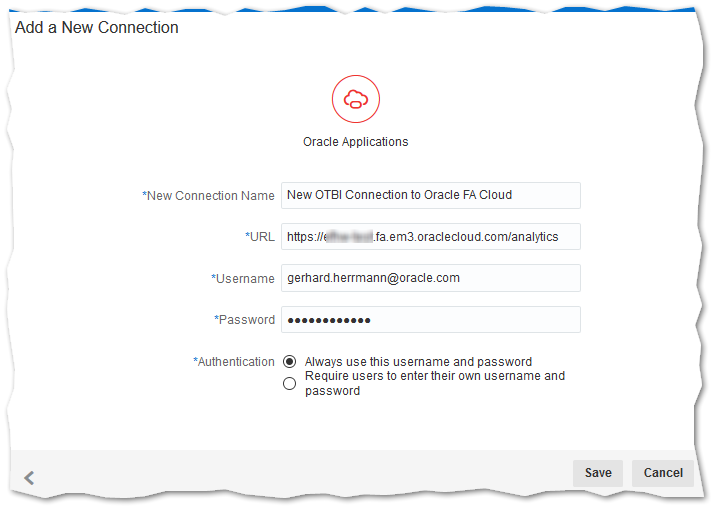 However, OTBI does have some limitations when it comes to extensibility (no access to metadata model) and adding of additional data sources (limited to data connection of respective FA instance). 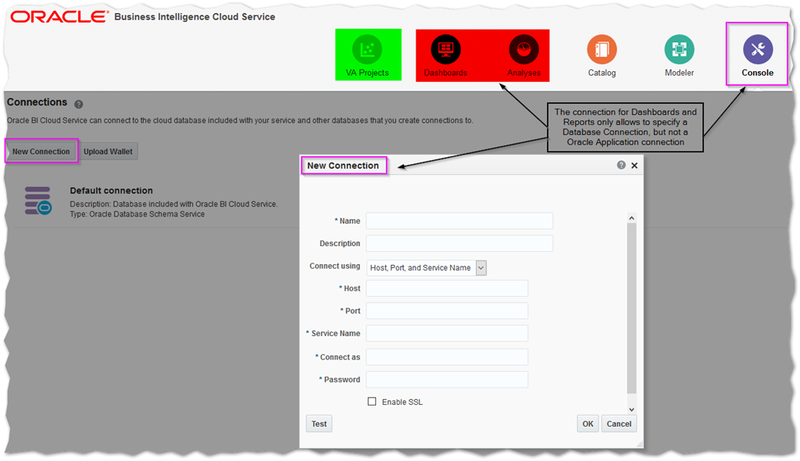 This Article only focuses on the latter three options (declaring the connection details without any data movement). 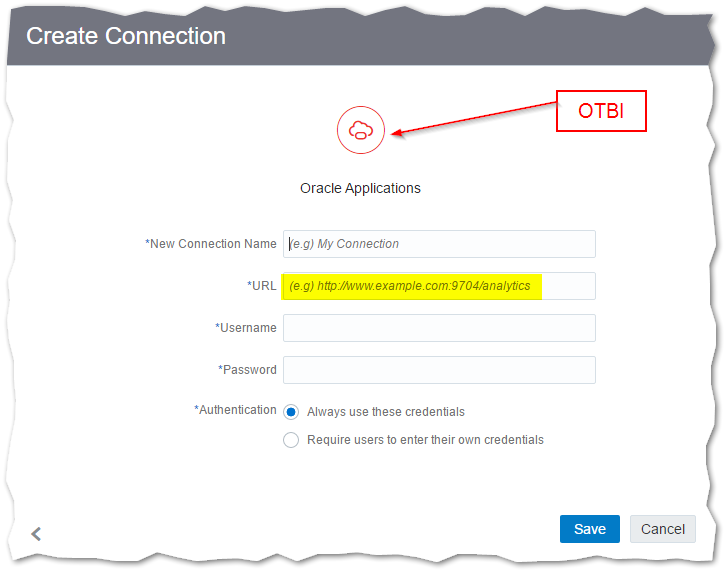 This “Oracle Application” is the reference to Oracle Fusion Application’s Cloud via the OTBI URL ! After the Connection was saved successfully, the Connection can be used to create a Visual Analysis. However, VA of BICS will only provide the possibility to access saved Reports, but not the Subject area’s itself (compared to DVD)! 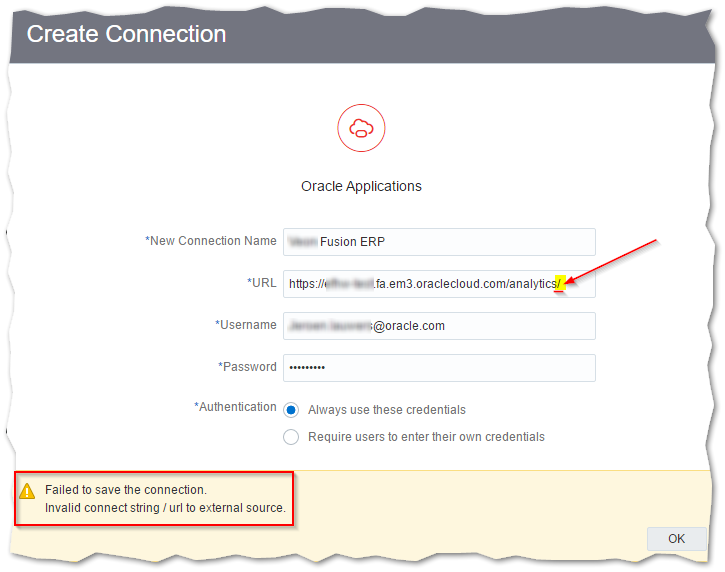 For Reports and Dashboards only a Database Connection can be added, but not a Oracle Applications connection. 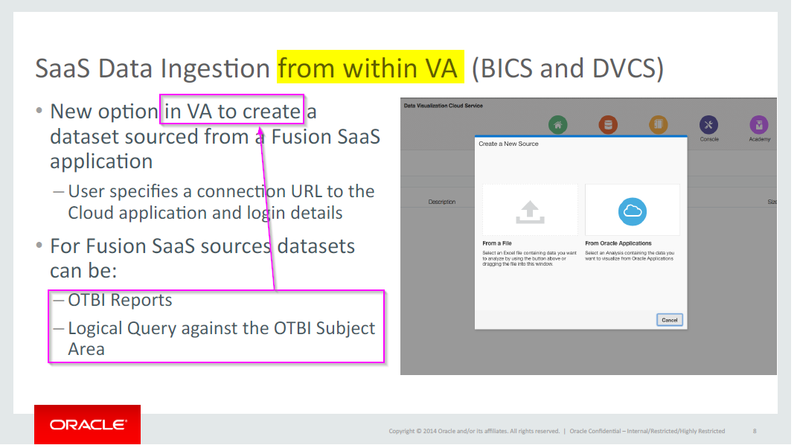 VA (via DVCS) can be used to connect to OBIEE .